In a contest for unfussy opening credits, Maurice Pialat's Police would definitely be in the running for a major gong. Consisting of just the single word title in large white type on a metallic background, it has no musical accompaniment and is on screen only long enough for slower viewers to read it before cutting unceremoniously to a mid shot of an uncomfortable-looking individual who, it is revealed after several silent seconds, is in the process of being interrogated by impatient police detective Louis Mangin (Gérard Depardieu). It's the Pialat style in essence, a no-frills approach that strips the standard police drama of its fat and announces from the off that the film is more interested in character than the mechanics of plot. The suspect in question is Tarak, a Tunisian petty criminal who's being pressured by Mangin to give up information on fellow countryman Simon (Jonathan Leïna) and his cohorts, a family group who are receiving legal representation from cheerful, good-looking lawyer Lambert (Richard Anconina). Trust and relationships are key to what unfolds. Lambert, it is quickly revealed, is on of Mangin closest friends, a borderline attraction of opposites for the suave defence lawyer and the more brutish detective. Both ultimately form a bond with young Noria (Sophie Marceau), the girlfriend of the quickly arrested Simon. Despite their releationship, Noria remains an outsider to Simon's family, who neither like nor trust this non-Tunisian and threaten her with dire consequences if she betrays Simon while he is in jail. As an act of faith she allows them access to her apartment, a move that later backfires on her but is later echoed when Mangin gives her the key to his own place to temporarily remove her from danger, a decision that will have consequences for his friendship with Lambert. Despite the casting of established actors in key roles, Police shares with Pialat's early work a strong sense of naturalism, and like his striking debut feature L'Enfance-nue, information on the central character emerges through conversation and encounter rather than scripted introduction. We're halfway into the film before we learn some crucial information about Mangin's family, which is casually revealed to a prostitute he is cheerfully showing around his apartment. As a police procedural, the film is true to the spirit of that sub-generic description in the screen time given over in the first half to simply observing interrogations, sequences that run for longer than you'd usually expect and without the dramatic plot reveal kick of L.A. 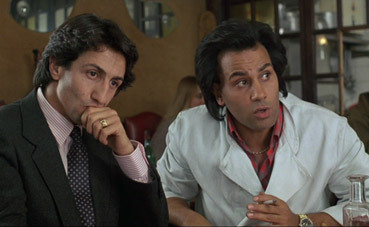 Confidential or the compelling character interplay of the box scenes in Homicide: Life on the Street, both of which Pialat's film pre-dates by some years. This is everyday police work rather than the exceptional or sensational, long and sometimes frustrating interviews with uncooperative suspects that lead to only further arrests and interviews, with the more explosive action restricted to two immaculately executed but over-in-a-flash arrest raids and a brief street shooting. This focus on the routine, lack of dynamic incident and absence of a strong thriller element is likely to leave some fans of this particular sub-genre a little wanting, but as a character study and an exploration of the dogged determination and casual rule-breaking that is sometimes required to crack a case, it makes for surprisingly compelling viewing. Pialat reverses the standard narrative rule of having the characters drive the plot by using the plot to drive the characters – we're not exactly encouraged to fret about the outcome of Mangin's investigations, and there's even a feeling that the whole investigation is actually a MacGuffin, only there at all to secure the required film funding and allow Pialat to go his own intriguing way with the story and characters. The turning point occurs in the final third, where the film all but dumps the police procedural element to explore the sensitive underside of Mangin's seemingly bullish persona, a style switch that has found as many detractors as admirers. Certainly there's an element of cliché to this – filmmakers are fond of telling us that inside every brute there lies a kind and sensitive man who just needs to find the right person to open up to – but the handling and performances still sell it as real. It's this truth that so effectively drives and textures the film, and as previously with Pialat there's often the sense that we're watching real people going about their real business, with the performers once again encouraged to improvise around a script whose writing sounds like a story in itself (watch the disc supplements and read the accompanying booklet for more on this). The presence of acting heavyweights Gérard Depardieu, Richard Anconina and Sophie Marceau may take the edge off the almost documentary naturalism of the station scenes, but this is balanced by what they bring to their roles as actors – Depardieu in particular is a ball of cheerful physicality (his scenes with Anconina are particularly engaging), but well able to make that vulnerable side both believable and, in the extraordinary final shot, genuinely touching. So does all this make Police a good film or a great one? It certainly depends who you ask. There are some who have greeted the film and this DVD release with the awe and enthusiasm of the discovery of the Holy Grail, while widely respected writer Paul Attanasio (he of Donnie Brasco and the aforementioned Homicide) is one of a notable few who feel the late story direction shift was a mistake. I sit somewhere between the two, unwilling to label the film as the masterpiece some believe it is (feel free to disagree), but entranced by the performances, the naturalism, and the plot and character detail, and I'm willing to go with the familiar aspects of that direction shift because the actors do such a damned fine job of selling it. Pialat's generic rule-breaking and semi-documentary approach also helped pave the way for many key works to come, including the one I still regard as the genre's finest, Bertrand Tavernier's superb 1990 L.627. Like Masters of Cinema's simultaneously released L'Enfance-nue, the 1.66:1 anamorphic transfer on this disc has been licensed from a French high-definition restoration and the results are excellent, a close to pristine picture whose contrast and colour are absolutely on the nose, the black levels in night-time exteriors rock solid without any loss of shadow detail. The print is spotless, as you'd expect, and the transfer is sharp without any sign of edge enhancement. The mono 2.0 soundtrack is also in fine shape, boasting a very good clarity and a decent dynamic range, most evident in the nightclub interior scene, where the music has far more punch than the mono mix might lead you to expect. There is a very faint background hiss if you want to get the headphones out and test it. As with L'Enfance-nue, the extra features are spread over two discs, the majority on disc 2. Conducted by Serge Toubiana on 23rd April 2003 just three months after Pialat's death, this is a revealing conversation with a refreshingly honest Breillat, who covers the problematic creation of the script without sugar-coating the difficulties or the conflicts with her director. She freely admits that she couldn't write a thriller because she'd never seen one, or do much with Depardieu's character because the police in the story didn't interest her, which may well account for why Pialat threw the first draft back in her face. The authenticity of the police station scenes is enhanced further when you realise that some of them were virtual transcripts of actual interviews Breillat had observed during repeated night shifts at real police stations, and despite her considerable contribution to the film she still regards Pialat as its true author. A fascinating inclusion. Plenty of giveaways on how the relationships develop here, so save it for afterwards. A collection of edited scenes that were cut from the film, intercut with a brief interview with the film's editor Yann Dedet, who discusses the editing (as he would) and some of the excised sequences, including why they were cut. There's some interesting material here whose inclusion would definitely have altered how we read Mangin, including very naturalistic scene with his young daughter and some tender exchanges with Yugoslavian maid Marisa, a character who was completely removed from the final cut. A priceless 12-minute 1985 excerpt from a 1985 French TV programme entitled Cinéma cinemas and made by Claude Ventura and Anne Andreu, that observes Pialat and Depardieu during the filming of a single scene on the 17th day of shooting on Police. Pialat's impatient and provocative side as well as his skill as at encouragement and persuasion is caught on camera, particularly in his work with real-life female police inspector Jocelyne Persillet, who is effectively playing herself in the film, but the glimpse of mid-80s Depardieu at work is an added bonus. C. Galmiche is the real lawyer who inspired the character of Lambert and was given a screen test by Pialat because he was fascinated by the man. It's not hard to see why. In just this short sequence the thin-moustached Galmiche comes across as a both a natural charmer and a potentially shifty spiv, and you can't help but wonder just how much larger than life he would be away from the intimidating glare of the camera. A traditionally structured retrospective video piece shot in 2002 by Virginie Apious that looks back at the making of the film through interviews with many of those involved in its production. Interesting in the way these things tend to be, some of the stories regarding the use of real cops and gangsters in the film are particularly revealing – actor Jacques Mathou suggests that there were gangsters who would have made good cops and cops who would have made good gangsters, while co-screenwriter Catherine Breillat reveals that she was able to persuade a burglar with just the face they were looking for to come along to the shoot because, she assures us, criminals idolise Depardieu. The same six you'll find on the simultaneously released L'Enfance-nue DVD, also from Masters of Cinema. As well produced as ever, the accompanying booklet has only two articles, fewer than we've come to expect from Masters of Cinema literature, but they occupy almost half booklet's 40-page length each and are both of considerable interest, so no complaints here. The first is a detailed 2008 examination of the film by Dan Sallitt, the second an extract from an extensive interview with Pialat, conducted by Alain Bergala and Serge Toubiana in 1985 at the time of the film's release. Film credits and stills are also included, and on the back cover there's a brief but revealing extract from a 1986 interview with a somewhat defensive Pialat. Police is something of a tricky sell, a police procedural that doesn't play by the rules and towards the end all but throws them out. The plot may take something of a back seat, but even in the later stages it's still ticking influentially over and does substantially contribute to the conclusion. But it's the detail and performances that make the film special, the naturalism of the background making even the smallest characters register (the distrusting Tunisian brothers are particularly believable). As with L'Enfance-nue, Masters of Cinema have delivered an impressively comprehensive 2-disc set whose extra features really compliment the film. Once again, the release comes highly recommended.